To fight deflation, abolish cash. Could Japan make reality of ‘science fiction’? With recovery elusive, a population doddering into old age and perhaps a decade of deflation in prospect, Japan may start mulling the most radical monetary policy of all — the abolition of cash. Unorthodox, untried and, said one Bank of Tokyo Mitsubishi strategist, “in the realms of economic science fiction”, the recommendation has nevertheless begun floating around Tokyo’s corridors of power and economists have described Japan as particularly suitable as a testing ground. The search for more outré economic policies continues, despite the recent surge in the Nikkei 225 index.The market may be reflecting soaring Chinese investment, rising consumer confidence and other cheerful data but economists see few long-term beacons of hope for Japan. Other extreme ideas mooted by the financial authorities include a tax on physical currency or introducing one to operate alongside the yen. The science fiction example which comes immediately to mind is Star Trek. Gene Roddenberry had the idea of a future where people are perfect and money isn’t needed. In his utopia people would do what they like to do without needing to be paid. The economic problems with that are obvious, and not even subsequent Star Trek writers went along. While there was concern with creating a new time line to avoid contradicting Star Trek canon, there are actually multiple contradictions already present. There were episodes in which it was stated explicitly that Earth had eliminated money while other episodes showed money in use. One episode of Star Trek: Deep Space Nine even involved the dilemma of Jake Sisko having to engage in a series of trades to obtain a gift because people from Earth had no money. 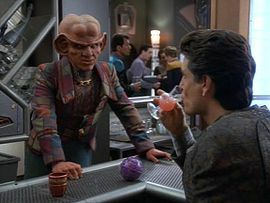 I’m sure that somehow Quark was paid by Star Fleet patrons as he certainly would not operate a bar just for the pleasure of it. This science fiction comparison really has nothing to do with the situation in Japan as they are actually looking at ways to make monetary transactions without the use of physical cash. It is already common there to buy things just by swiping their cell phone, making the elimination of physical cash plausible. Posted in Economy, International, Science Fiction, Television. Tags: Gene Roddenberry, Science Fiction, Star Trek. RSS feed for comments on this post.. TrackBack URL. Japan Succumbs to Deflation as Consumer Prices Fall Record 1.1% Bloomberg. Yet another sign that Japan is coming apart in a serious way.